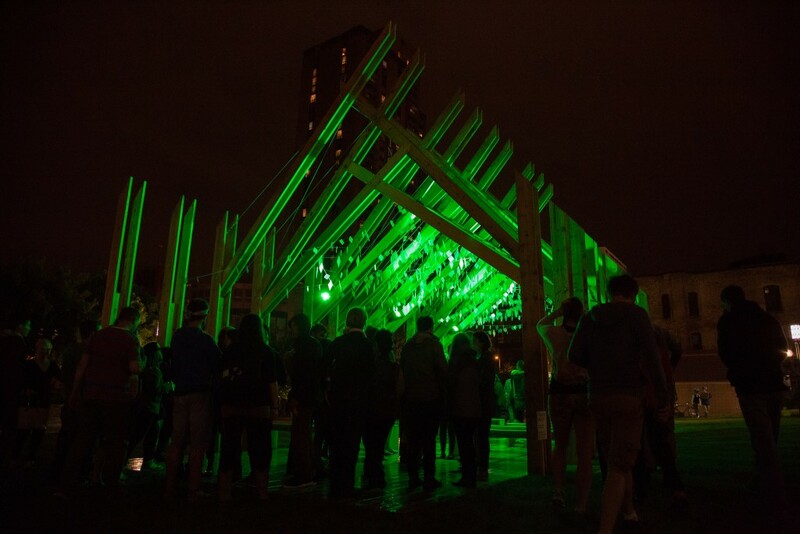 Balancing Ground is both a playful space and a vibrant sculpture that can be activated by 1 or 100 people. It will be built on the foundation of community voices talking about balance in life and work. If you are willing to listen, Balancing Ground will literally speak to you. 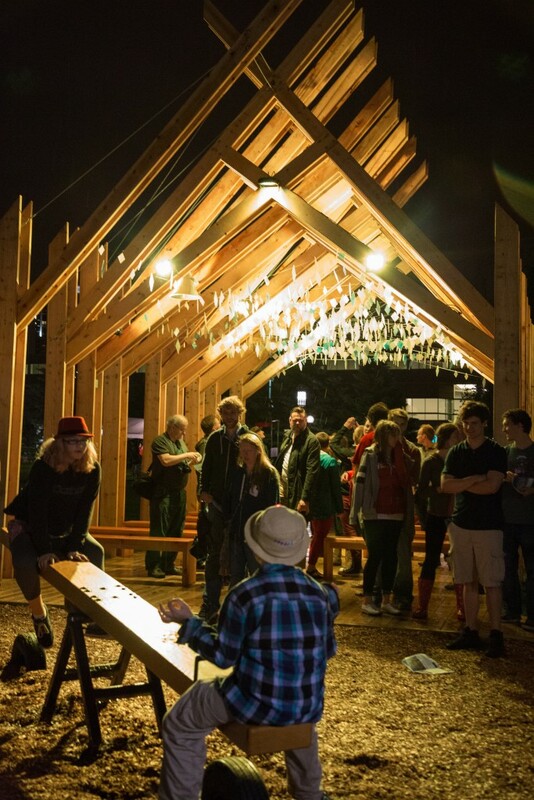 A skeletal wooden structure houses six rows of five-foot-long pairs of wood benches and six ten-foot-long playground-style teeter-totters. 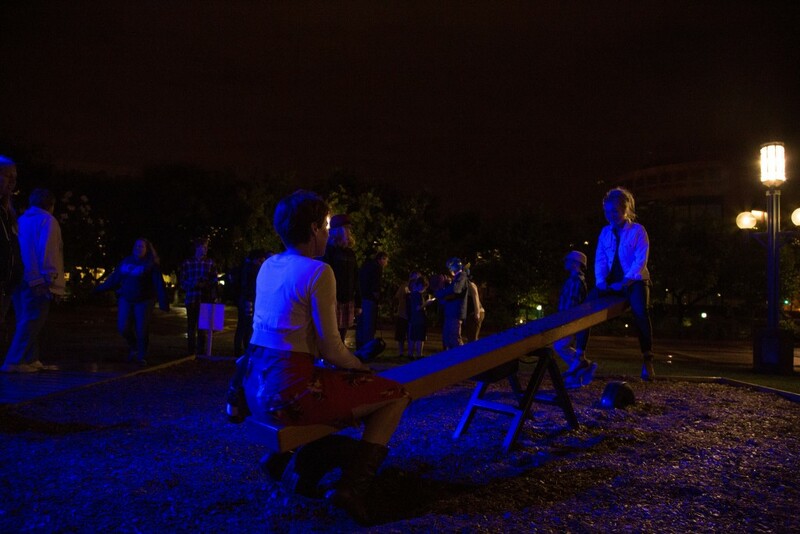 These dynamic see-saws (driven by individual Arduino processors and accelerometers) allow people to play with physical balance and also to hear and to reflect on certain words and phrases that are evocative of balance–audio files are triggered as people go up and down, evoking a dialogue between the two sides. The voices will range from a square dance caller talking about the trust needed between partners on the dance floor, to a horticulturalist describing the stress on apple trees and the sweetness of their fruit when they are out of balance, to a local professor who writes about the ever-changing role of the Mississippi river for Twin Cities residents. It will take a city to build our sculpture. Inside the space, specialized directional speakers play longer fragments of conversations and interviews about balance in tight, narrow beams of sound that can only be heard while in specific areas. 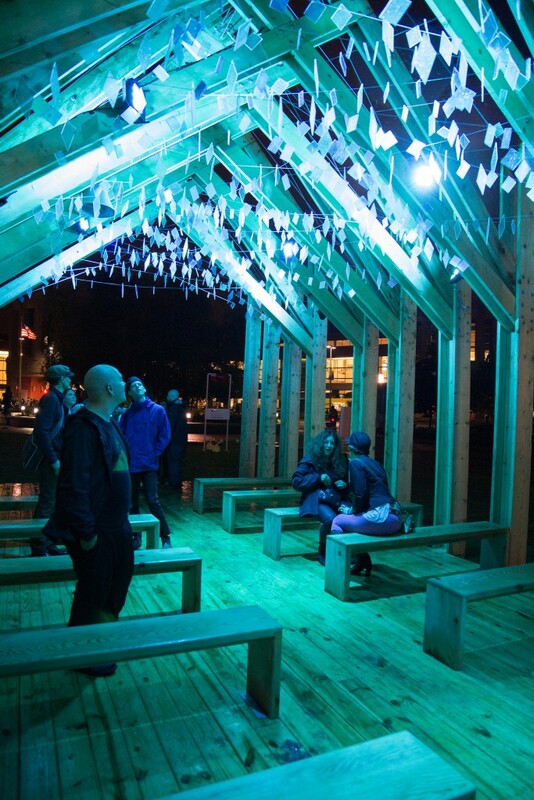 This provides an intimacy to the act of hearing; one can hear a voice just above a whisper while the sound doesn’t spill out loud into the public space. The installation gently reacts to the natural light transitions of the day through the lengthening and shortening of the structure’s many shadows, accentuated by the structure’s placement on the plaza. 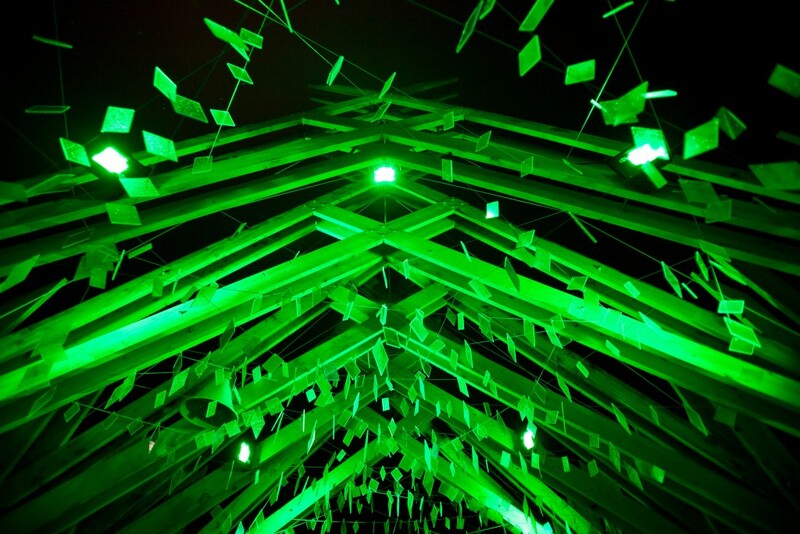 A canopy of prisms and reflective fragments are strung between the rafters casting bits of the rainbow spectrum down to the seating area below. The structure, proportions and fractured light suggest a sacred space deconstructed to its most elemental architectural components. 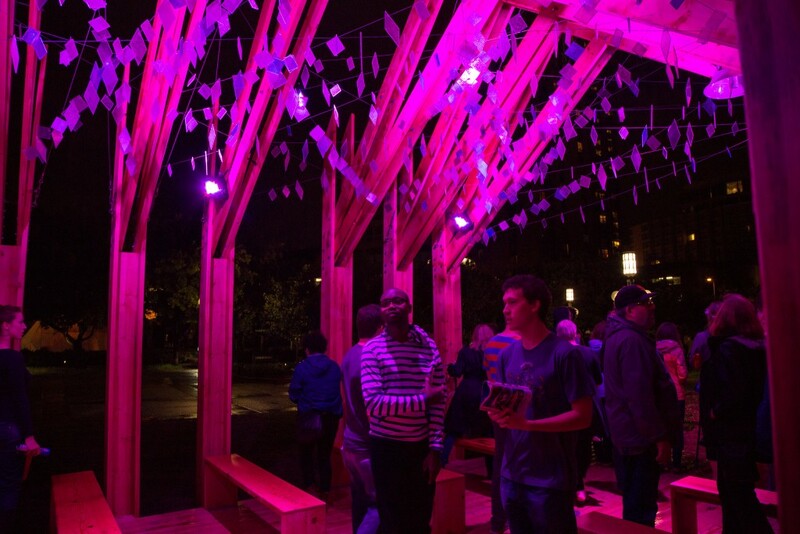 As the sun sets, theatrical lights illuminate the structure and the reflective materials of the canopy above, transforming the structure into an enlivened environment and an inverted silhouette of the intricate overhead patterns and shapes. We hope that our proposal presents a space that has beauty, meaningful interactivity and playful participation. We’re interested in mixing movements that are calm and active and hope that in this space it is possible for people to successfully activate in large groups or as an individual; again calling back to the notion of a community or the sacred spaces of our cities where there is the possibility to have a moment of epiphany, whether the place is full or whether you’re the only one there. Throughout the summer we plan to regularly activate the space with public events, including first Sundays with the Gorilla Yogis, square dances led by a local caller and band and community sings! 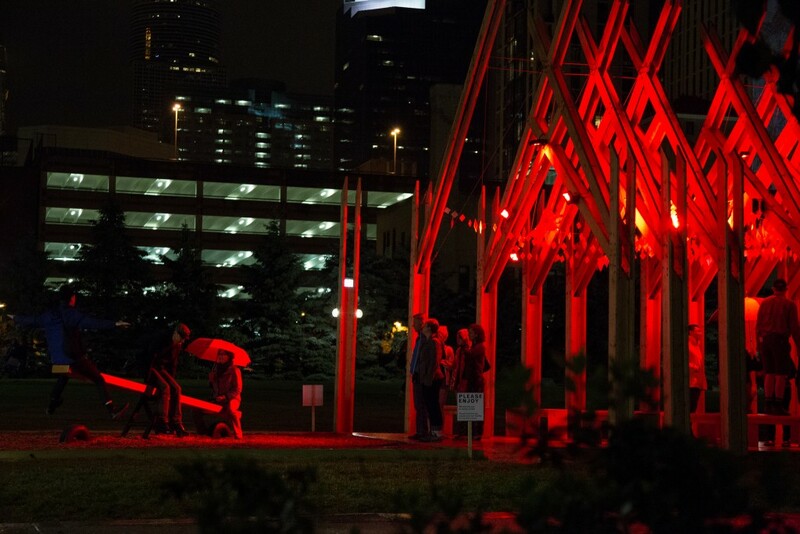 At the conclusion of the summer installation, the materials from the installation will be donated to Habitat for Humanity so that Balancing Ground will give back to the city that supported it.